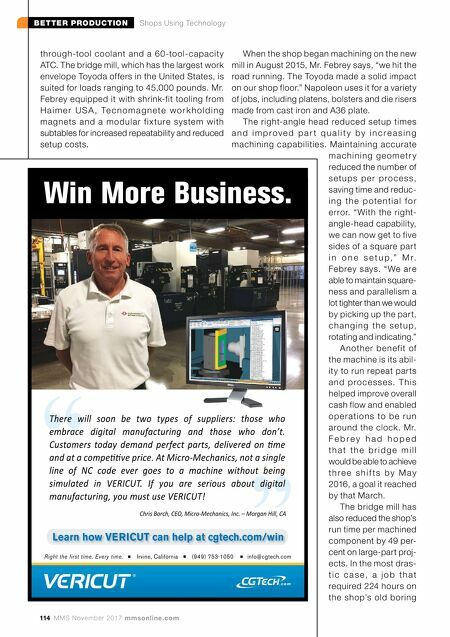 BETTER PRODUCTION Shops Using Technology 114 MMS November 2017 mmsonline.com When the shop began machining on the new mill in August 2015, Mr. Febrey says, "we hit the road running. The Toyoda made a solid impact on our shop floor." Napoleon uses it for a variety of jobs, including platens, bolsters and die risers made from cast iron and A36 plate. 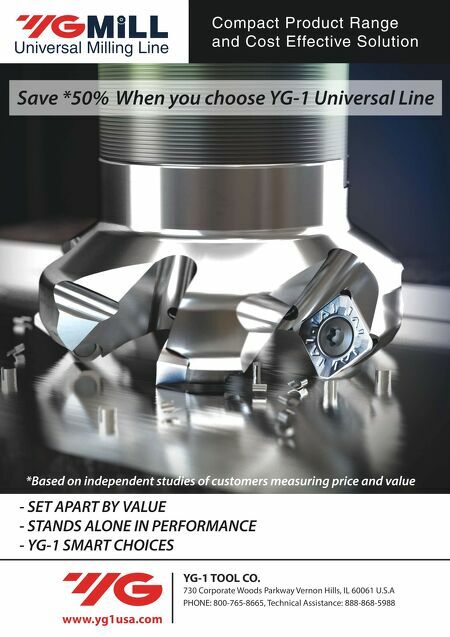 The right-angle head reduced setup times a n d i m p r o v e d p a r t q u a l i t y b y i n c r e a s i n g machining capabilities. Maintaining accurate m a c h i n i n g g e o m e tr y reduced the number of s e t u p s p e r p r o c e s s , saving time and reduc- i n g t h e p o te n t i a l f o r error. "With the right- angle-head capability, we can now get to five sides of a square part i n o n e s e t u p , " M r. Febrey says. " We are able to maintain square- ness and parallelism a lot tighter than we would by picking up the part, c h a n g i n g t h e s e t u p, rotating and indicating." A nothe r be nef it of the machine is its abil- ity to run repeat parts a n d p ro c e s s e s. T h i s helped improve overall cash flow and enabled o p e r ati o n s to b e r u n around the clock. Mr. F e b r e y h a d h o p e d t h a t t h e b r i d g e m i l l would be able to achieve t h r e e s h i f t s b y M a y 2016, a goal it reached by that March. The bridge mill has also reduced the shop's run time per machined component by 49 per- cent on large-part proj- ects. In the most dras- t i c c a s e , a j o b t h a t required 224 hours on the shop's old boring .com " " through-tool coolant and a 60 -tool-capacit y ATC. The bridge mill, which has the largest work envelope Toyoda offers in the United States, is suited for loads ranging to 45,000 pounds. Mr. Febrey equipped it with shrink-fit tooling from H a i m e r U S A , Te c n o m a g n e t e w o r k h o l d i n g magnets a nd a modula r f i x ture syste m w ith subtables for increased repeatability and reduced setup costs.